Have your getting ready photos documented! There is so much action, emotion, and excitement that it makes for priceless wedding photojournalism. Make the most of your wedding photographer’s time by having everyone ready (except for the bride) by the time the photographer arrives. Straighten up the rooms that the wedding photographer is shooting in before they arrive in order to make the best use of their time…so that they can start shooting right away, instead of cleaning up. Move bags, boxes, clothing and food out of the way. Move anything that could be an eyesore in the photos. 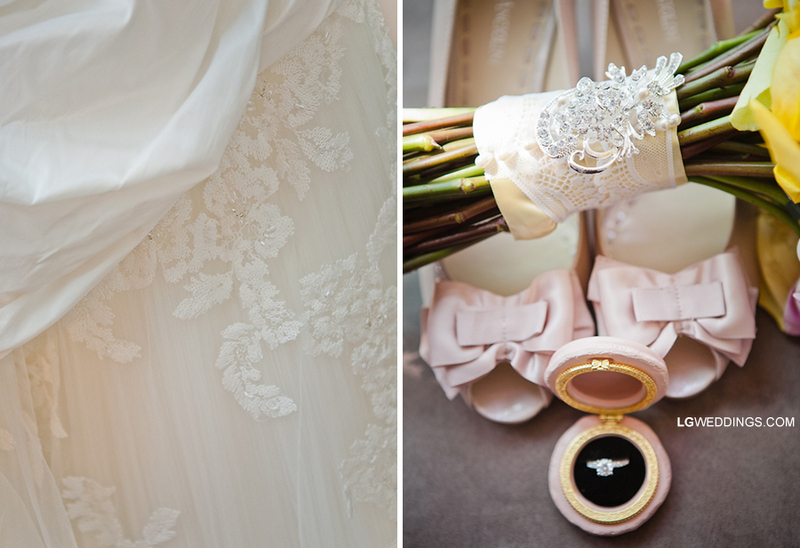 Put all the bride’s special detail items (shoes, jewelry, invitation, veil, garter, etc.) in a safe, noticeable spot so that the wedding photographer can get detail shots without having to search or ask around for these items. Have the dress taken out of its bag, hanging in a safe location, preferably in a room with plenty of natural light. Have bouquets, boutonnieres and corsages delivered before the wedding photographer arrives so that he/she can get photos of bride or groom putting on mom’s corsage and dad’s boutonniere. There is really nothing else quite like the softness of natural light, so if possible, choose a room with large windows to get ready in. If you foresee that your house will be a disaster-zone on the wedding day, consider other locations for getting ready at. Hotels are an obvious choice, but you may also check to see if your venue has a nice space for you to use, or consider getting ready at a friend or family member’s home. Know the rules of the venue or wedding officiant in advance. If they don’t allow flash or if they don’t allow photos for most of the ceremony, your wedding photographer isn’t going to break these rules. 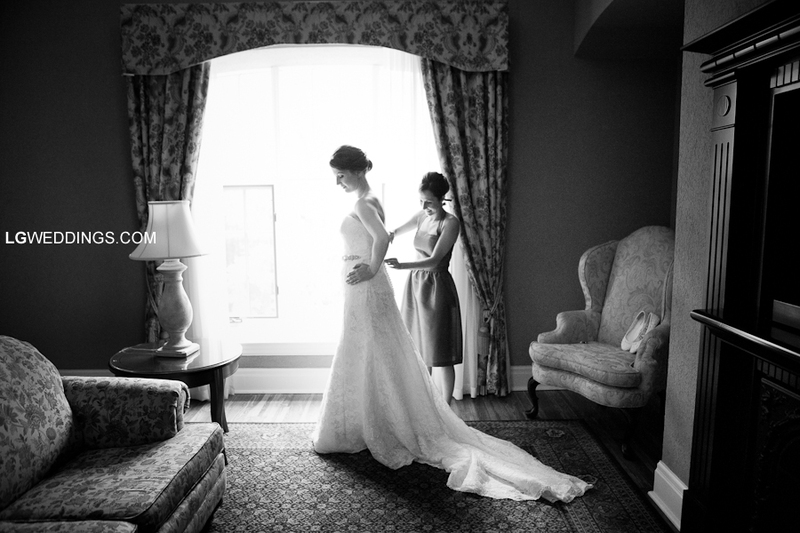 Give your photographer enough time in the schedule to chat with the officiant a few minutes before the ceremony begins. It is so important for the bride and groom to be aware of (and to be okay with) the impact that these rules may have on their wedding photos. Hire a wedding photographer who always brings along a second shooter, for at least part of the wedding day. Not only is this essential to have as a backup for emergency situations, but also for them to station themselves in different locations during the ceremony, to be as unobtrusive as possible. This way they can get a variety of angles without moving around too much and drawing attention to themselves. Lg Weddings is one of the few Toronto wedding photography companies that ensures clients have a professional second shooter present at all wedding ceremonies. If getting married outdoors in the midday sun – keep in mind that this lighting can be a little harsh (even with the best flashes, diffusers, and post-processing). Consider standing under a canopy of light fabric to soften the light on your face. 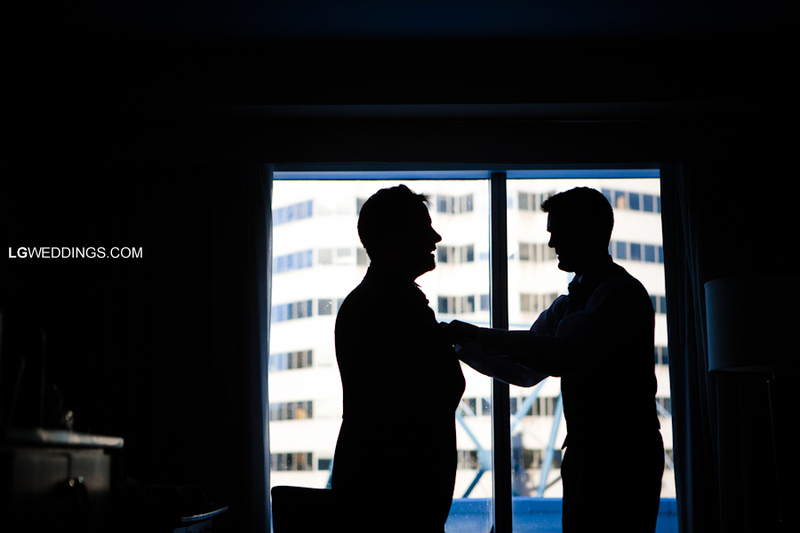 If you want soft, warm and romantic back lighting then schedule your ceremony for late afternoon where you and the groom can be softly backlit as you say your vows. If you don’t have much time allotted for family photos, ask family members to refrain from taking group shots alongside your photographer. This prolongs the entire process, plus there will always be one or two family members not looking into the professional photographer’s camera, but off to the side, where someone else is snapping their photo. Consider each group shot to take about 3 minutes when determining how much time is needed for family portraits. It can take several minutes to round people up for their photo. To save time, create larger groups and keep one-on-one poses for immediate family only. Elect a family member to help gather the appropriate family members for each group shot. Give a checklist of each group pose (include names) to the photographer and a copy to the family member helping out. Bring an extra pair of shoes or boots to protect your fancy heels from messy terrain. The same goes for all the girls in the bridal party. Have flip-flops handy for if your feet start to ache from wearing heels all morning. Don’t be afraid to get a little bit dirty (no one will notice a few grass stains under the hem of your dress) and be open to photos that involve a lot of movement or even some poses where you may be sitting. Be ready for light rain – everyone in rain boots or carrying umbrellas can make for some cute photos. Rain will cause damage your photographer’s cameras, so they would need access to a covered porch to shoot from, if you decide you want photos in the rain with your umbrellas. Believe it or not, heavy wind can be even more of deal-breaker than light rain, so keep this in mind on a windy wedding day when having your hair done and deciding on utilizing your (already booked in advance) indoor option. Photography survival kit: tide-to-go, mini sewing kit, bobby pins, travel size hair gel or spray, lip gloss or lipstick, blotting paper, mirror. Give enough time in the schedule for your wedding photographer to get detail shots of the room, cake, favours, etc., before guests arrive. Seat your photographer(s) as close to the action as possible. It is really hard for them to grab photos of kissing games when seated in a completely different room during dinner. Feed your photographer. Some weddings are longer than 12 hours with a schedule so hectic, there is no time to even munch a granola bar. Ask your venue coordinator to feed your photographer at the same time as guests eat, so they are able to re-energize and take amazing photos throughout the night. Encourage your wedding photographer to travel from table to table with you and get photos with friends that may have been missed during cocktail hour. SMILE….it really is essential. Breathe. Relax. Smile. And have fun! The day goes by so quickly. Take a moment to stop and savour it. And enjoy the lasting memories your beautiful photographs will bring you for a lifetime.